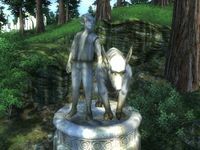 Clavicus' dog, Barbas, may be Creeper from Morrowind. Listen to him when he talks about what he used to be. Amongst other things, he says, "For a while I was a scamp, making deals with Orcs." Esta página foi modificada pela última vez à(s) 08h05min de 1 de junho de 2015.